We could never have imagined how much hope and healing jetBlue tickets could create. JetBlue® has been an invaluable supporter to Stars of HOPE® for many years. 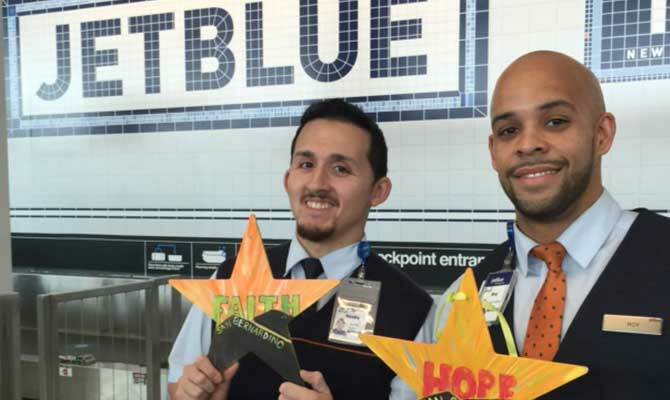 Following the Brussels terror attack in 2016, JetBlue employees painted Stars of HOPE during Respect in the Workplace Week to lift the spirits of the people of Belgium. During Take Our Children To Work Day, the children of JetBlue employees created Stars of HOPE to bring hope to rural communities in Ecuador after the earthquake that took the lives of hundreds and injured thousands of people. The support provided by JetBlue has enabled us to send staff and volunteers to many parts of United States, including the one-year anniversary of the terror attacks in San Bernardino, CA and at Pulse Nightclub in Orlando, FL.